The working days between Christmas and New Year’s is either called ‘Nothing Week’, or ‘Nonsense Week’ by some of my more unfortunate friends. Those who have to work, that is. If you haven’t already experienced it, you’d have discovered these past days that work has been really, like, you know, a lot, you know? And like, you know, wah lao, come from everywhere, like, you know? You’d also have known that if you didn’t plan every hour of these types of days, you’d forget to eat and sleep. So it was a very good thing the past couple of days that I had the good sense to plan (to buy) dinner. At the Zion Road Food Centre tonight, I had a craving for soup noodles, so I looked around for a stall that sold the stuff. Then I was reminded that there was that Famous Prawn Noodle (Hay Mee) Stall there, at Zion Riverside Food Centre, where there’s also the Famous Char Kuay Teow Stall, the Famous Wonton Mee Stall, and the Famous Rojak Stall. As I stood in front of the stall, the Hay Mee Man looked up from behind the glass pane and asked what I wanted. I said in Mandarin, ‘Big Prawn Noodles‘. I asked for the ‘Not So Big Noodles’, which were $10. And as he halved the (still rather) large prawns and boiled them in the pot of stock, he muttered something about ‘business no good these days’. That probably meant I wasn’t gonna be able to ask for an extra prawn. He went on to talk about how he had wasted money on advertising, and that it didn’t help his business any. Good thing at this point, the soup noodles were done, and I had to take my dinner, which was very yummy, by the way. After I was done, I popped by Hay Mee Man’s stall again and asked if I could take a picture of him standing in front of the stall, for you know, to put online on the internet so that my friends can see it and they can come by and eat his Famous Hay Mee? Hay Mee Man declined, saying he wasn’t ‘used to it’, so I just took a picture of the stall. ‘Ask your friends to come and try lah’, he went on. ‘Yah, that’s why I’m putting this up on the web’, I said. ‘Aiyah, no use one lah, I try before’, he sighed, again. iTunes is playing an illegal copy of Frosty The Snowman from the album “The Very Best Of Christmas Favourites” by Roy Hargrove/Christian McBride of which I have the original CD. Pingback: Life as I know it. the uncle sounds really depressed. maybe i can get my dad to bring my whole family there sometime. Put at miyagi website sure got use one…but miyagi, where is Zion Road Food Centre?!?! What the Hay Mee Man don’t know is, you are putting it up on miyagi.sg and not some ulu web pages. lol….. Think the Hay Mee Man going to have a surprise why suddenly so many people come…. wah kaoz. 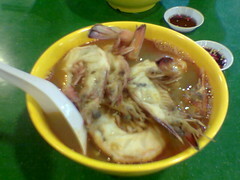 $10 for prawn mee. I thought only happens in hotels where you have to be careful not to slurp loudly. Zion Rd Food centre is right opposite Great world. Damn! Now, I’m getting hungry. Please lah, hang cheng pai where got people order $10 bowl one. Real hang cheng pai people will only order $2 mee, haha. the hay mee is really good… they have another one at Adam Road food centre… which is also very good… try the bee hoon dry with lots of chilli powder!! YUMMY! Actually the $5 bowl is good enough lah…. rich yuppies always get conned. you can get much better prawn noodles for cheaper. the prawns this stall uses is the water logged big prawns which do not have much taste. This hay mee uncle cooks nice prawn mee…. but he is always depressed…. is it his marketing tactic? This hay mee uncle cooks nice prawn meeâ€¦. but he is always depressedâ€¦. 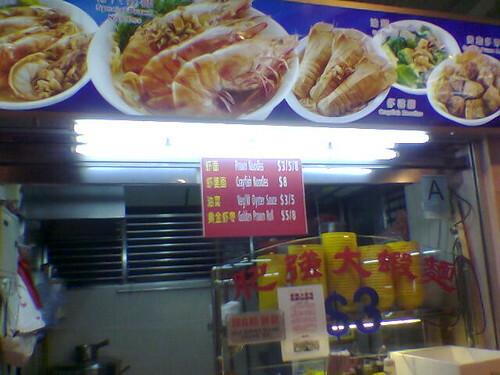 Pingback: Prawn mee breakfast on Flickr - Photo Sharing!